On June 25, 2014 at 8:30am, Gaslowitz Frankel, Georgia’s premiere Fiduciary Litigation and Estate Dispute Resolution law firm, is launching its new Radio Show called “Wealth Matters“ where attorneys Adam Gaslowitz, Craig Frankel, and Robert Port will discuss the opportunities and challenges of preserving and managing wealth. Our goal with this Radio Show is to help people avoid some of the issues we deal with every day in our litigation practice. Gaslowitz Frankel, Georgia’s premiere Fiduciary Litigation and Estate Dispute Resolution law firm, is launching its new Radio Show called “Wealth Matters“ where attorneys Adam Gaslowitz, Craig Frankel, and Robert Port will discuss the opportunities and challenges of preserving and managing wealth. They will interview wealth managers, financial advisors, CPAs, trust experts, and other wealth pros. Gaslowitz Frankel LLC is an award-winning trial practice firm specializing in all aspects of complex fiduciary litigation, representing individuals, companies, banks, and fiduciaries in will, trust, and estate disputes; investor and financial advisor disputes; shareholder/partnership disputes; contract disputes; complex commercial disputes; and appeals. Gaslowitz Frankel has been selected as a Best Law Firm in Georgia in Trust and Estate Litigation. The Firm’s managing partner Adam Gaslowitz is listed in the Guide to the World’s Leading Trust and Estate Litigators. 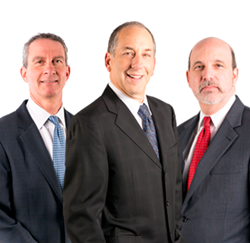 Both Adam Gaslowitz and Craig Frankel have been widely recognized by their peers and the media as leaders in trust and estate litigation. To see all new guests, pictures, and videos, follow Gaslowitz Frankel on Twitter @EstateDispute, subscribe to the hashtag #WealthMatters, or visit a special Pinterest board for the show here. Tune in for the inaugural episode on Wednesday, June 25th at 8:30am on Gwinnett Business Radio's Wealth Matters.